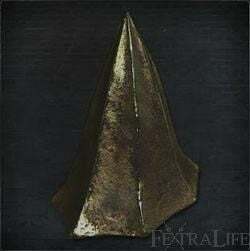 Gold Ardeo is a Head Armor (Attire) in Bloodborne. It is part of the Executioner Set. "The odd helmet worn by the band of Executioners commanded by the martyr Logarius. The conical gold helmet, symbol of the executioners, represents luminosity, ambition, and an unflagging resolve to face impurity, staring it down with stern golden spirit. As the great Logarius once said, "Acts of goodness are not always wise, and acts of evil are not always foolish, but regardless, we shall always strive to be good." Lore related tidbits on The Mysteries of Cainhurst Garb & Architecture (Lore), and From Berserk to Bloodborne. Dis mus be da piramid hed lik. Da silent hiw 2. I wonder if this helmet was inspired by the actual pyramid head? How is my hunter supposed to see while wearing this thing? So it&apos;s stupid that the Gold Ordeo has high bolt defence. "... Staring it down with STERN golden spirit." I realize that an r followed by an n looks like an m... But in the context of the sentence, why would it say stem? If you haven&apos;t already noticed, when wearing the Gold Ardeo it will tilt to the left while you&apos;re standing still. I tried looking under the helmet, and it looks like the character model&apos;s head is actually leaning to the left. I wonder if this is a bug or if its supposed to give an impression of how heavy or something. I&apos;m not sure if Alfred&apos;s head tilts too because NPC&apos;s head rotate around to look at you. I kind of like the idea that the Gold Ardeo makes you "not quite right in the head", after all, Alfred is a pretty great guy, until we see him wearing his Ardeo. Is it okay that it twitching and moving a lot when you walking? The Gold Ardeo DOES NOT produce a clang on each rung of ladder. Having a link to the video adds nothing of value to the page, in fact it only spreads the myth of the Gold Ardeo producing sound. this thing&apos;s more expensive than most of the weapons and its just for fashion blood.